Smoke signals | Simon Says… You really should drink this! It’s a good while since I’ve had a smoked beer, so there was a bit of a hole in my beer review repertoire. I had this idea that I didn’t like them. I’ve since had some Laphroaig and broadened my palate. I am looking forward to the imminent release of Smokey Bacon from Bo Bristle and so thought it was time I got my laughing gear around a few smoked beers. 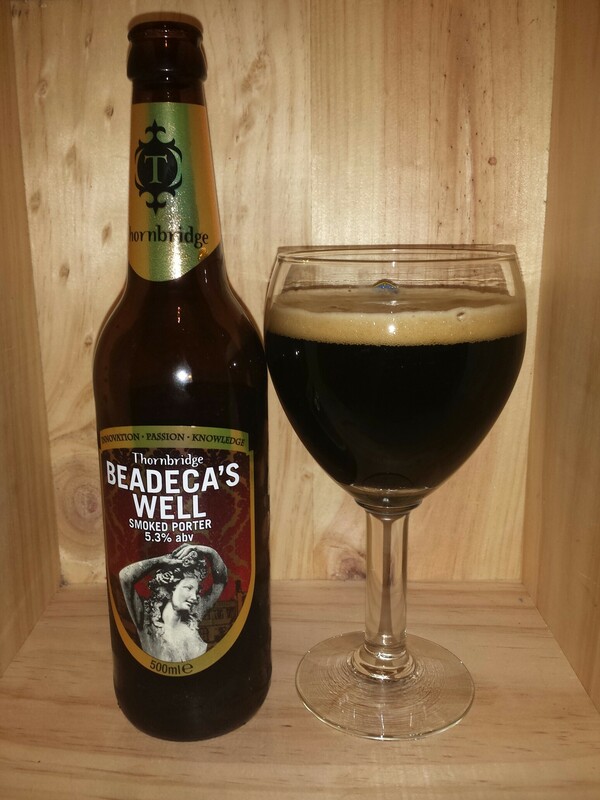 My old favourites Thornbridge’s were first up with their Beadeca’s Well. Ireland is dotted with St Brigit’s wells so I suppose this is old Albion’s equivalent! That smoke hits you square in the face when you pop the cap and again as you pour it. As you get into it it really mellows out and it’s warm and you get caramelly maltiness. Fantastic beer. I’ll be visiting a classic smoked beer later this week but tonight it’s that Game of Thrones finale and the Ommegang special beer I’ve been saving for it! This entry was posted in Uncategorized and tagged Beer, English, Porter, Smoked Beer. Bookmark the permalink.